One of the TED talks I have watched the most and basically require other people to watch is on The Surprising Science of Motivation. In the presentation Dan Pink talks about Intrinsic Motivation, something which as a programmer, film maker, entrepreneur and activist I am very deeply motivated by. In the TED talk Dan Pink basically explains the core premises behind his book Drive. I loved the book so much that I purchased multiple copies and gave them away as presents. When Dan’s website showed he was going to release a new book I jumped on the pre-order. Well the book, To Sell Is Human arrived yesterday and straight out of work I started reading it. Waiting for the bus, riding the bus, at home until I basically fell asleep. I’ve only read 72 pages so far (out of 250), but I’m loving it. There are two types of selling. The normal sales type, of which 1 in 9 Americans are employed to do (a lot more than I expected). But there is also the non-sales selling. Things like a teacher convincing a student to study for the up-coming test, or an entrepreneur pitching their idea to potential co-founders. The thing is, pretty much everyone is doing non-sales selling. They are moving people. Getting them to change their ways or part with time, expend effort and do things which are the the mutual interests of both parties involved. When most people thing about salesmen they think of the classic used car salesmen, Avon ladies, or insurance salesmen. Those situations, especially use car sales were fraught with information asymmetry. The seller knew if the car was a ‘lemon’… A dud that would break down and be very expensive to maintain, or if it was a peach. So the buyer had to beware. However these days it is the sellers that have to beware. With the Internet and sites like eBay, Amazon and the like it is easier for buyers to do research and know more about the product than the salesmen do and if they suspect any deception or problems they can buy it online. The new ABCs of selling is no longer Always Be Closing. It is attunement, buoyancy and clarity.Attunement : Being in tune or harmony with the people, groups and contexts with which you are trying to move them.Buoyancy : The ability to bounce back from rejection and why believing in what you are selling is essential. Clarity : The capacity to make sense of murky situations. What matters more today isn’t problem solving but problem finding. Uncovering challenges that the other person may not know they have. In the world of information overload curation is also important. 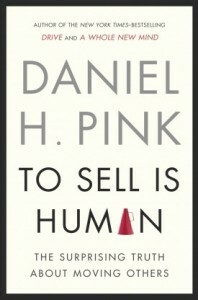 My only real issue with the book so far is that Dan Pink spends so much time trying to convince the reader that selling is a big part of the modern world, something I already understood, that it has taken a while to get into the actual techniques . Have you read the book? If so what did you think? NB : I am not affiliated with Dan Pink in any way, nor am I getting any money for this post. I just like his stuff.